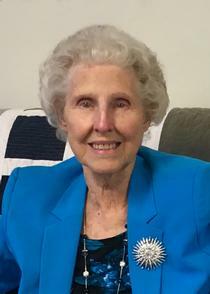 Lavonia "Cricket" Pearl Porter, 90, of Salt Rock, went home to be with her Lord and Savior on April 6, 2019 surrounded by her family. She is preceded by her husband, Cleedith Porter. She was born on February 22, 1929, the daughter of the late Elmer and Pearl Sergent. Cricket was also preceded in death by her son, Philip Porter; her brothers, Leonard and James Sergent; and her sister, Marie Lowe. She is survived by her son, Dwight (Renee) Porter; daughter-in-law Linda Porter; grandchildren, Joshua (Carrie) Porter, Katherine (Dax) Hancock, Amanda (John) Morrison, and Beth (Travis) Prichard; great-grandchildren, Chynna Bolen, Morgan Porter, Nickolas and Makinley Prichard, Liam and Elias Hancock, and Harper Morrison; great-great-grandchildren, Briilee McReynolds and Lilith Chapman; and a host of nieces, nephews, family and friends. Cricket was a gentle, caring, wonderful Christian woman who was loved so much by so many people. She lived a life devoted to her Heavenly Father. She was a member of Mt. Calvary Church in Salt Rock, WV and a retired cook for Salt Rock Elementary. Her family wishes to thank the staff at St. Mary's Medical Center for their exceptional love and care over the past week. Visitation is from 5 to 8 p.m. Monday at Wallace Funeral Home in Barboursville, WV. Funeral services will begin at 12 p.m. noon Tuesday, April 9, 2019 also at Wallace with Brother Jason Salmons officiating. Burial will follow in the Porter Cemetery in Salt Rock, WV. Pallbearers will be Joshua Porter, John Morrison, Tim Eplin, Travis and Nick Prichard, Dax, Liam and Elias Hancock. In lieu of flowers, the family request a donation be made to the Emogene Dolin Hospice House in Huntington, WV. Online condolences may be expressed to the family at www.timeformemory.com/wallace. There are currently 9 condolences. We are sending our love prayers and condolences to the Porter Family at this time Cricket meant so much too many of us and my family down through the years. We will hold our memories and talks dear to our heart. We wish we could be with all the family at this time, but due to health reasons we will not be able to attend services. Love and Prayers Rex and Pauline Slone Unroe. To Cricket’s Family. So sorry for all of you. Also sorry I cannot be with you. Cricket was loved by all that knew her. In Tx but would love to be in WV love and Prayers. My condolences to the family on your loss. I always, before she passed, enjoyed stopping to visit with Gr-Aunt Pearl & Cricket. They gave me great stories and information on the Nida side of our family. From the very first time that I met them, they made me feel like I had known them my entire life. May God give you the strength to ease your burden of your loss. My prayers are with you. I so sorry for your loss! Love and prayers for comfort for family and friends! Our thoughts and prayers are with your family during this time, Cricket was my mother's cousin, she was such a sweet person we always visiting with her during our younger days of growing up and visiting family in West Va. She will be missed . Due to health reason's my parents Rex & Pauline (Slone) Unroe won't be able to be with you at this time. We love your all. So sorry for your profound loss. Many loving memories of this sweet aunt. I know you are so so happy to be with Jesus . But you will be so missed you are one special lady.